The Florida Supreme Court recently ruled that defense attorneys can’t ask plaintiffs in personal injury lawsuits if their lawyers referred them to physicians for treatment. In other words, if you are injured because of another person’s negligence and you file a lawsuit, the defense can’t ask you whether your lawyer referred you to a particular doctor. That information is protected under the attorney-client privilege. Why does it matter if your lawyer referred you to a particular doctor? Some defense attorneys will question the integrity of the lawyer-doctor relationship to cast doubt on the veracity of the plaintiff’s claims. But now, thanks to the Florida Supreme Court ruling, defense attorneys can no longer ask that question. The plaintiff in the case is a woman named Heather Worley. She filed a lawsuit against a Central Florida YMCA after sustaining an injury from falling in the parking lot. She was taken to the emergency room at Florida Hospital East, where doctors referred her to a specialist for knee pain. Worley didn’t immediately go to a specialist because she didn’t have health insurance. Instead, she retained legal counsel and then received medical treatment. At Worley’s first deposition (where you give evidence under oath), the YMCA asked if her attorneys referred her to the treating physicians. Worley’s counsel objected, but the YMCA kept asking the question (in subsequent depositions, by submitting requests for information, etc.). Worley objected to these requests, and the issue worked its way through the court system until it reached the state Supreme Court. 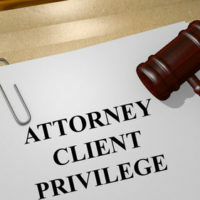 The attorney-client privilege protects communications between attorneys and their clients. It is a legal protection ensuring that discussions between attorney and client remain confidential so that they can speak candidly. This protection enables attorneys to represent their clients more effectively. Under Florida law, communications between lawyers and clients are confidential it they weren’t intended to be disclosed to third parties. In other words, evidence that you plan to present in court isn’t confidential. Why Is This Ruling Important to Me? It’s very important that you seek medical attention if you are injured because of someone else’s negligence. If you want to reach out to an experienced attorney beforehand, and we recommend a doctor who can treat your injuries, you don’t have to worry about that conversation somehow being used against you in court. This decision strengthens your right to keep communications between you and your attorney confidential. You should consult with an experienced attorney immediately if you are injured because of another person’s negligence. Contact a West Palm Beach personal injury attorney at The Pendas Law Firm today for a free consultation. We will help ensure that you receive the compensation you deserve. The Pendas Law Firm also represents clients in the Miami, Fort Myers, Tampa, Jacksonville, Orlando, Fort Lauderdale, Daytona and Bradenton areas.